I can’t believe it. But, you are reading the 1000th post of this blog. The Delete Bin started in its first incarnation in 2003, and petered out. Then I revived it and relaunched it on December 18 2007. It’s been going strong since with at least two posts a week. For those of you who have been around for that long, thanks for still following along. This blog wasn’t always in the format that it’s in now. It actually wasn’t always a music blog, exclusively. But, as things sometimes unfold as they need to, this blog became what it is pretty naturally anyway. And there have been some highlights. Not all of them have equalled to worldwide recognition. Actually, no one post has done that just yet. But, there have been little events that stand out in my mind that have helped inspire me to continue to pilot it, beyond my need to write about the music I love for just the sheer joy of it, of course. As is my custom here, I’ve chosen 10 such highlights that stand out for me as being milestones in the life of this blog, The Delete Bin. Here they are! As mentioned, the Delete Bin started in 2003, mostly as a place where I could host some essays on albums, and thoughts on a bunch of other topics. It was the era of the “dear diary …” model of blogging which is not what most blogs are about anymore. When I relaunched in 2007, I really wanted to write about songs, and do it in a way that was more like the music magazines I admire, although still from my own point of view as a fan. A big favourite song of mine at the time was this one, a ’60s-like garage tune full of tempestuous energy. So, I wrote a very short piece about how great I think it is. And the guy from the band, Chris the bass player of the Draytones, commented on my humble piece, thanking me for writing it. That was a revelation to me as a writer, that my words could reach the ears (or the browser) of my subject. This really spurred me on to write more, and to concentrate on my thoughts and reactions to the creative process of songwriting and making records, which I find pretty fascinating. I didn’t always gain the attention of the musicians I admire after this post. But, it wouldn’t be the last time this would happen. This was an early post that diverged from the now standard “Listen to this track … enjoy!” format. But, Keith Moon has always been a fascinating figure in rock history, as well as being one of my favourite rock drummers. One night, I was watching a documentary in the series The Last 24 hours. In it, the story was told of Keith Moon’s last day on earth, an affecting tale that for me really humanized Moon, making him more than just an icon but rather a man who had weaknesses, charms, as well connections to friends and loved ones who missed him when he was gone. A bonus in writing this post was that one of the actors in the TV show commented on the post, which was pretty cool. But, the overarching effect in writing it was the idea that music and musicians have something to say about the human condition, because the songwriters and performers who sing the songs are just as subject to the foibles of being human as we listeners are. This was a game-changing realization for me, and significantly affected how I would proceed as writer and editor of this little blog I’d created. It made me think more seriously about how humanity and art vitally intertwine. Therefore, it changed the entire trajectory of the blog, giving it what I hope is the identifiable thread that runs through every post written since; that popular music reflects humanity’s strengths and weaknesses, and helps us to draw lines from historical events into the present, and into the future, too. That is worth writing a 1000+ posts about. By the time this one went live, I’d laid down a format that is recognizable today; introduce a song, say something about it and how it connects with the human experience in some way, then out with links. In this case, it gave me a chance to talk about a song I loved, and about some memories it evoked for me about being at the titular festival during the late 1990s-early 2000s. Little did I know that this would instigate an email conversation with Daniel Wylie, the creative brain behind the Cosmic Rough Riders “band”, which initially began as a vehicle for his songwriting, later to become a band in its own right without him. Amazingly, Daniel told me that he’d found this little blog of mine through a friend of his, Ken Stringfellow of the Posies – another band I’d written about, and love. Yet, it was Daniel’s own thoughts shared with me about being a musician in an industry not generally known for its fairness that really fascinated me, along with his insights about this song (inspired by Joni Mitchell’s feelings about Woodstock, the festival after which her song is named, he said). It was a pleasure to get to speak with him, and I had this post (and Ken Stringfellow, apparently) to thank. There are some songs that, when they come on the radio, you feel a rush of joy. This song by meat-and-potatoes power-pop-pub-rock band The Kings is surely one of those for me. So, I decided to write about it, full as it is of effervescence and a bit of mischief too. It is generally known as a “one-hit wonder”, although the band are actually responsible for many other songs at this same level of quality. But, as I pointed out, “one hit wonder” is not a pejorative term in my world, and certainly not on this blog. And as luck would have it, Mr. Zero who is the co-writer of this song saw things my way, and commented on the post. Other fans of the song gathered around the post too, and some great discussion happened. It seems that a lot of people think of this song in the same way as I do. And Zero added some insights himself, as only he could do having written the song. That’s another thing, too; I’d grown up hearing this tune on the radio. This post directly allowed me to say “Thanks!” to one of the guys who wrote it. That was a pretty big privilege, and certainly a revelation for me as a writer. Like many music fans, I find Bob Dylan to be a singularly fascinating musician. I also have spent time talking with other people about one of the roadblocks to Bob fandom for the casual listener, and that is his voice. But, when you listen to his records over the decades, it’s pretty obvious that Bob has used more than one voice to deliver his material. So, thus was an idea for a post born, going on to be one of my most popularly read, commented upon, and generally far-reaching pieces to date. One such group to cotton on to it was the Bob Dylan portal site Expecting Rain. Hence, in came the Dylanologists, some questioning my approach, but others joining in on some pretty interesting discussions that came out of points I’d made. That was pretty rewarding. A few months later, I got a DM on Twitter from another singer-songwriter I admire – Tracey Thorn – who requested permission to quote me in an upcoming book about singing that she’s writing. Wow. Over the moon about that, and I can’t wait to read her book. Anyway, the takeaway here for me is that music fans can help to shape the narratives about the music we love. It seems like a pretty simple idea. But, it’s just so powerful. It’s an honour to be a part of something like that. I’d started doing interviews on the ‘Bin a little over four years ago, starting with independent musicians who were (and are!) doing really interesting work that made for some pretty good material for more of a dialogue, rather than just from my own point of view. I’d first heard of Eli “Paperboy” Reed through a song of his called “(Doin’ The) Boom Boom”, which is a savagely cool R&B tune found on his second record, released during a time when retro-soul music was just beginning to jump. When his PR company emailed me to ask if I wanted to do an interview, I jumped at the chance. It would be my first with an artist on a major label. I came up with some questions, and sent them off hoping for the best. That’s what I got. Eli was very, very generous with his answers. I think I may have won some points by not asking him about his “Paperboy” moniker, and asking about his process, and his origins as a a music fan instead. Once again, I got a chance to say “thanks”, which is always huge. But, I also learned that even when artists are on a major label, they still want to communicate as directly with fans as they can – well, a lot of them do! And once again, I found myself playing a role in helping an artist whose work I loved get the word out. That felt really great, and has certainly inspired me to keep doing it as the rest of the entries on this list will show. By this time, I get quite a few requests for features and for interviews with young, hungry bands. In the back of my mind, I’m always wondering how many of them are on the way up, and how many are, well, not. Very often, this has little to do with the quality of the music itself, which is a real shame. But, sometimes the stars align. I heard this song through one of these requests, and I heard something in it. Also, I was intrigued with the band’s story – there’s something to be said for a narrative that a writer like me to build on, ready-made. Anyway, I did the interview, and the band’s management were very good about sharing the link (not all of them are). But, weeks and months later, I began to notice this song as I came and went. I saw the video for it when I traveled to Montreal. I heard it used in a Mountain Dew commercial. And of course, I began to hear it all over the radio. These guys had really made an impact, and continue to do so today. Good going, YTG! And once again, I felt very privileged to play even a microscopic part in spreading the word, and being a part of a continuing story of a group of musicians committed to their art, and on their way up. A good friend of mine works in online promotions, one of her clients at the time being Paperny Entertainment. That company produced a show called Dust Up, about crop dusters in Saskatchewan. Singer-songwriter and soundtrack composer Jay Semko, also from Saskatchewan, provides the music to each episode. So, through my friend and in aid of promoting the show online, I got to interview Jay Semko who also helped to provide another important soundtrack; that of my teen years in the 1980s, when Jay served as a singer-bassist in pop rock band whose records I loved, The Northern Pikes. It was a pretty big thrill for me to chat to Jay about music in general, and the process of creating soundtrack music specifically. Once again, my subject was very, very generous with his answers and therefore with his time as well. And along with being a great, in-depth piece as a result, I found that I learned tons from the experience about how soundtrack music is made. Many of the posts I write try to touch on the idea of the creative process, that a lot of work goes into the music we love that we sometimes think has always been around, without thinking of the effort that made it possible. But, in working up the piece, it was clear to me that Jay was as much enamoured of the process of composition for TV as he is of being a songwriter and performer, which he also continues to do. With this piece, I was left with more than just a Q&A, and was let into a world of enthusiasm by a guy spending his life doing what he loves to do. It was a real pleasure – inspiring, in fact. One of the great things about being a music fan in the 21st century is that so many layers are available to us. This was a classic case of this. We went to see Sondre Lerche at one of my favourite venues here in the Lower Mainland, The Biltmore Cabaret. Opening for him was Kishi Bashi, an artist whose primary colours are between his voice, his violin, and his sequencer, allowing him to create huge vistas of sound all by himself. And he can write songs. So, I picked up his EP at the show and played it the next day. Then, I sent him an email, asking him if he’d be interested in being interviewed. It was the first time it worked that way around. Thankfully, he agreed! The result was a pretty good interview that put a link on his Wikipedia page, which was a nice bonus. So, from a live show, to an EP, to an email, to an interview that ended up on a Wikipedia page. How 21st century is that? And once again, it completely undercut the traditional distance between fan and artist. And it was a lot of fun, too. I’ve been a Ron Sexsmith fan since 1995, on the release of his self-titled record on Interscope. I’m not generally a completist when it comes to recordings. But, I’ve got all of the guy’s records; like I said, I’m a fan old-school style. I not only think he’s one of the greatest songwriters our country has ever produced, I think he’s one of the best songwriters that any country has produced. Anyway, when I got a chance to interview Ron, it was a huge deal for me. This was around the time that the film Love Shines came out, a documentary about Ron and the making of his album Long Player Late Bloomer, and produced once again by Paperny Entertainment, with whom a friend of mine collaborated. So, it was through that connection that the interview was set up via email. Ron was on tour at the time, and so he answered my questions while traveling, which was very generous, considering. After the piece went live, I caught the show in Vancouver at the Rio Theatre and met him after the show. I thanked him for a good show, and for the interview. “Did you get what you needed?”, he asked. Yes. Yes, I did – and more! Once again, it was great to be able to help tell the story of a guy who’s art has affected me in such a positive way, while also showing me that meeting one’s heroes isn’t always a disappointment. I started The Delete Bin as a means of talking about various thoughts, and eventually about my love of music, the creative process, and my fascination with how the human experience is intertwined with art, history, and culture. And maybe this particular “10 songs” entry is a bit self-indulgent. 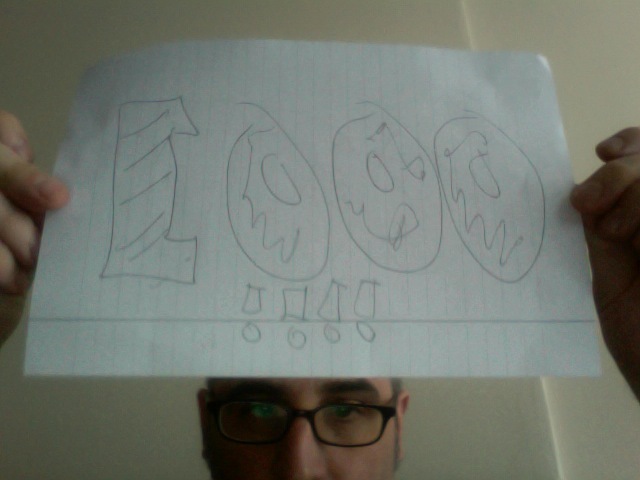 What “This Is My 1000th Post” piece wouldn’t be? But, I hope that my gratitude to being able to participate in telling the stories of songs, and of artists, has come through too. Here’s to another 1000 posts! Keep it up – I like it when you cover something I love. Ilove it when you introduce me to something new. Happy 1000th. That’s what I try to do. Thanks for reading! Well done! Great you have such enthusiasm and can share it. Regards Thom. Awesome to see the Ray Semko and Ron Sexsmith interviews on that list! Yeah! Me too! (thank you!). Congrats on your 1,000th, Rob! Great reading these highlights. I particularly enjoyed “8 voices of Bob Dylan” and was impressed at how widely it was picked up. Proof that you are a powerful voice in the musical commentary blogosphere. A really great piece to boot. Please keep those Delete Bin pieces coming!!! That was a fun one, and I’m so glad that the discussion kind of took off. Thanks very much for reading (and commenting!). It’s one thing to like stuff, it is quite another to write about it passionately, thoughtfully and always respectfully. And to do that over 1K posts shows extraordinary stamina and commitment. I’ve probably read only 10% of the Delete Bin posts but they have all been tight, entertaining and perceptive. When I’ve had the time I have hugely enjoyed following a trail through your archive (such as our shared love of Power Pop). Congratulations Rob. The Delete Bin has been a significant inspiration to Vinyl Connection. Thanks a lot, Bruce – your input has been very appreciated. Cheers, Rob! Keep writing, please. Dang! I remember well the evening I came across your site, and equally the next few evenings I spent crawling back through to number 1. It’s been an enjoyable sojourn, bless you lad! Thanks a bunch for joining me on that sojourn!